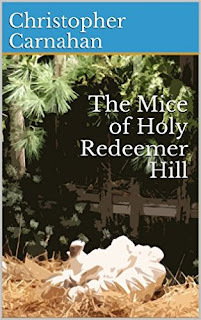 After a disastrous year, a little, overworked mouse named Mystic and her family are trying find the joy of Christmas. As their preparations are underway, menacing rats dampen their holiday spirit. Nosey kids pose a constant threat. They’ve managed to make friends with a rambunctious scurry of squirrels who have vowed to protect and keep them safe in their home in a crèche outside of Holy Redeemer Parish. The parish is home to a dedicated but lonely priest and two nuns who teach at the church school. Together they are on their own quest to help those struggling during the Advent season. A National Guard veteran recently returned from war struggles with symptoms of PTSD. A homeless man seeks redemption. A young woman tries to escape from an abusive relationship. As the drama unfolds, their lives intertwine with those of the creatures on the grounds the parish grounds building to an explosive ending. Written so that the story unfolds throughout the Advent season, this book is broken into 25 short chapters that can be read once a day from the first of December until Christmas. I was drawn to this book as part of my festive reading as it was described as kind of an advent book, with 25 chapters to read throughout December. I think I would have found it hard to link the stories together if I had only read one chapter every day, so I read a few chapters at a time. The book touches on the side of Christmas we don’t like to see, but should be reminded of – those who are homeless, suffering from PTSD, victims of domestic violence, or separated from loved ones. It reminds us of forgiveness in the face of adversity, to never give up and that small is mighty. Although there were some nice little stories, I was expecting a warm Christmassy glow at the end which unfortunately I didn’t get. I received this e-book from Books Go Social in exchange for an honest review.